The Rooster Crows by Maud and Miska Petersham retells many familiar American rhymes and jingles. Many I had heard before, but some were not so familiar to me. The vintage illustrations are colorful and detailed, depicting the storylines accurately. Although we enjoyed this book, I would suggest reading it in smaller bits. After a while, my kids asked for a different story, but they did enjoy hearing moreat a later time. 1. “Excellence of execution in the artistic technique employed.” –Beautiful artwork typical for the time period,with bright colors and details. 3. 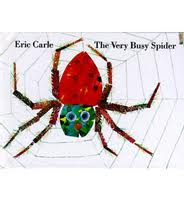 “Appropriateness of style of illustration to the story, theme or concept.” – Yes – perfect for this type of book. 5. “Excellence of presentation in recognition of a child audience.” – The picctures are very appealing for children and adults alike. Andy and the Lion by James Daugherty tells the story of a little boy who visits the library to find a book about lions. He reads about lions all day long, his grandfather tells tall tales about lions in the evening, andthen Andy dreams about lions through the night. Thanks to his prodigious imagination, Andy is able to help a lion he meets on his way to school, then visit again with the lion at the circus and in a parade. The black and white illustrations highlighted in copper tones are very numerous in comparison to the number of words in the story, successfully engaging the attention of even young readers through thelong story. My only complaint with this book was that page turns happen frequently in the middle of a sentence, which made the reading feel choppy to me, but kept the story moving. 1. “Excellence of execution in the artistic technique employed.” – The detailed black and copper-toned line drawings are engaging for all audiences. 2. “Excellence of pictorial interpretation of story, theme, or concept.” – Yes, the pictures help the story come alive. 3. “Appropriateness of style of illustration to the story, theme or concept.” – Once can see through the pictures what is in Andy’s imagination. 4. “Delineation of plot, theme, characters, setting, mood or information through the pictures.” – Yes,the book satisfied all of these checkpoints very well. I particularly enjoyed the emotions expressed on the faces of the lion and thepeople in the story. 5. 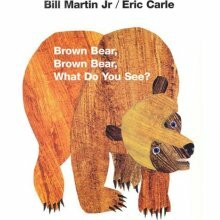 “Excellence of presentation in recognition of a child audience.” – My children did enjoy the illustrations and story, and they laughed right along with me as we read together. 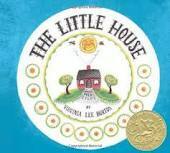 Caldecott Medal Book 1943 – I consider The Little House written and illustrated by Virginia Lee Burton to be a true classic book for its story as well as the pictures. The Little House, built on a hill far from any town before cars were invented, enjoys the surroundings of trees and flowers, seasons changing, and the night sky. As the city grows closer and eventually surrounds the little house, all of these pleasures are blocked from view. The house, once beautiful, becomes run down and tired. Finally, a relative of the house’s builder recognizes the house and has it moved to a new hill amongst trees and flowers, changing seasons, and the night sky. The little house is very happy to be lived in and taken care of once again. The illustrations superbly depict the storyline as the reader is shown, with each page, more and more growing up around the house and the house beginning to get lost among the other things. The house starts out colorful, slowly looses its color, and then is returned to its original vibrance. I especially enjoy the pictures depicting the house in each season. 1. “Excellence of execution in the artistic technique employed.” – The folk art-type pictures remind me of a Grandma Moses picture. 2. “Excellence of pictorial interpretation of story, theme, or concept.” – Wonderful! 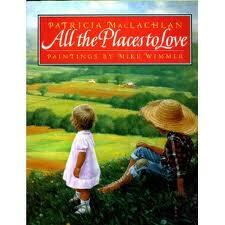 Even without the words in this book, the story could be understood well. 3. “Appropriateness of style of illustration to the story, theme or concept.” – Yes – a somewhat country feel pervades the pictures. 4. “Delineation of plot, theme, characters, setting, mood or information through the pictures.” – Yes, easily understood through the pictures themselves. 5. “Excellence of presentation in recognition of a child audience.” – These pictures are colorful and very interesting to look at, but certainly simple enough for children to understand. 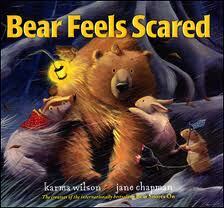 Summary: Bear Feels Scared written by Karma Wilson and illustrated by Jane Chapman can soothe and calm many childhood fears. Bear is walking through a forest when he starts to feel scared as he realizes he is all alone and hears noises that are unfamiliar. When he finds his friends, he is reassured, feels safe, and is able to calmly sleep. Pros: Once again, I love Jane Chapman’s illustrations and her pointed use of light. A funway to teach children that when they are scared, they are not alone. This might also be a good conversation starter with preschoolers about self-calming techniques. Cons: Hopefully it would not introduce new fears in children that don’t usually experience being scared.